Cycling is very dangerous, yet it has the simplest of actions. Something most of us learned while being a small child. I suspect most have some memories of sore knees and elbows, gradually earning the selfesteem needed to pedal on our own. There are many things which can happen during a ride. Like one of my nightmares; a sting from a wasp or a bee. 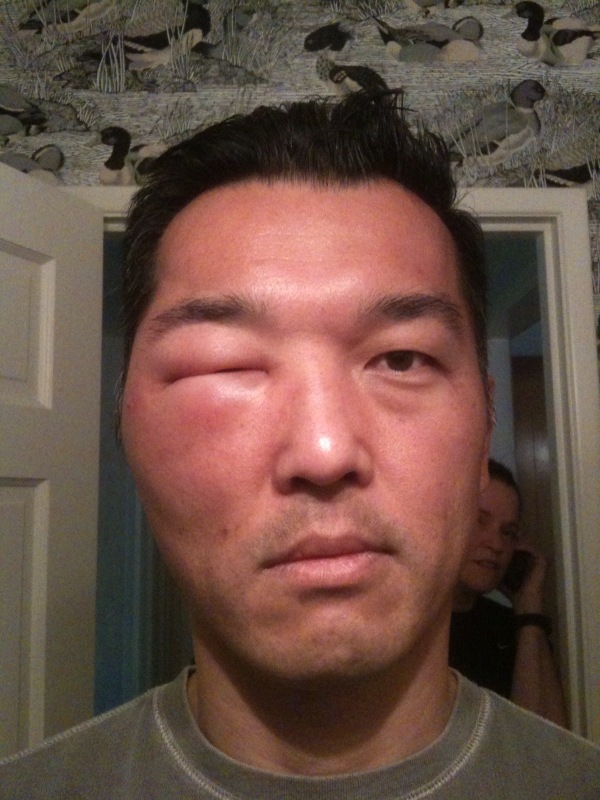 I have been able to get a fly into my eye a couple of times, but they do not sting. Oh yes, they do hurt while descending in 70 km/h, but at least my face does not look like Jonathan Vaughters' in 2001. Photo by Brian Jew, downloaded here. Back then Vaughters was riding on Crédit Agricole, the French bank which for a long time supported a team in cycling. 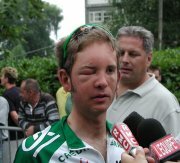 The team was doing a training ride, Vaughters participated in his third Tour, when a wasp stung him just over his right eye. Now, cycling in the tour alongside some 180 riders in the peloton is one thing, up and down mountains. Doing that without any depth-sight is just stupid. Safety comes first so he withdrew from the race and finally took cortisone so his face "doesn't look like a basketball", according to this great article by Velonews. The gentleman on the picture below actually came to my interest as I googled "Vaughters" and "sting", because I knew I'd seen a picture of Vaughters earlier. On this forum, he claims to be Jonathen (sic) Vaughters re-incarnate. And I can see why. Apparently, he got a stung by something. Whatever that was, I wont be near to find out. Note the guy in the back calling 911 or his mates to come over with popcorn and 3D-glasses. I don't know if everybody will have a reaction like this if stung by a bee, wasp or anything else. Maybe you have to be allergic to that particular insect or its venom. I do know this; this is why cyclists wear glasses while riding. Do yourself a favour, buy some glasses and at least you will have minimized the risk.